... However, we decided to stay at home in Dartford so I turned my attention elsewhere and came up with a shortlist of Maidstone, Maldon Prom, Great Lines or Whitstable. But just as I was settling on Maidstone, the river Medway burst its banks and flooded parts of the course - Maidstone parkrun was called off. That left three options and Great Lines parkrun just felt like the right place to go. On the day, the wife decided to stay at home while me and Matilda hit the road to Gillingham. The good thing about visiting a venue that I had already been to was that I wasn't tempted to run around taking photos for a full-on course description on the blog and I could just enjoy the festivities of the day. Looking around, there were lots of christmas themed hats and costumes being worn and gave the day an extra special feel. 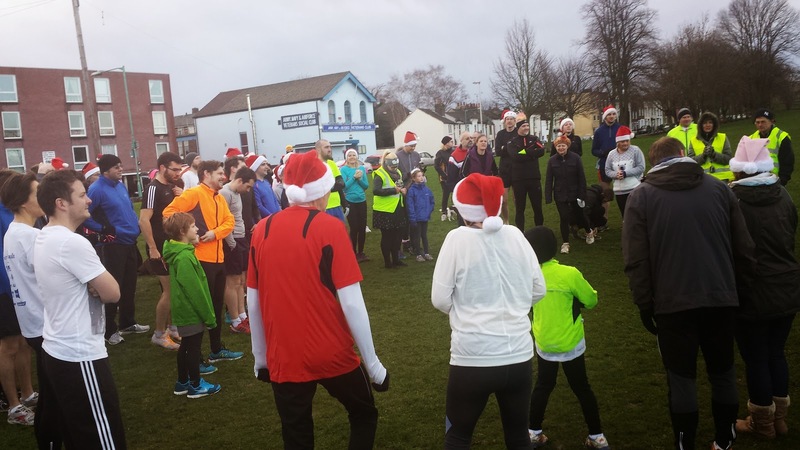 With the two adjacent parkrun venues (Maidstone and Shorne Woods) both not having Christmas day events, Great Lines had become a focal point for North-West Kent's Christmas Day parkrunning and the turnout was pretty good with 75 runners. Being on pretty high ground, the course had not suffered like many others following the recent storm and apart from a couple of puddles was basically bone dry. Matilda had brought her wand, her santa toy and her jingle bells, so we had the great sound of jingle-jingle-jingle all the way round the course! 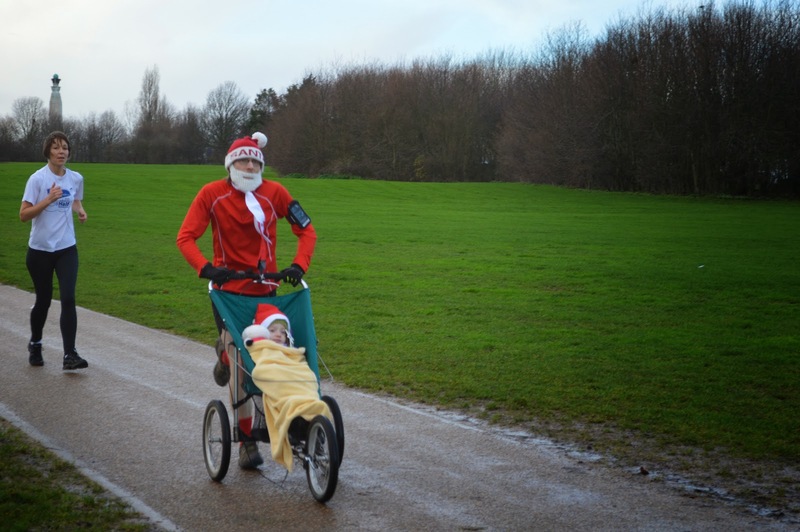 We did our two laps, and Matilda really loved the long gradual downhill at the end of both laps - we flew down it on both occasions. Our kilometre splits were all over the place and our last kilometre ended up being our fastest of the whole run (sub 4 minutes). 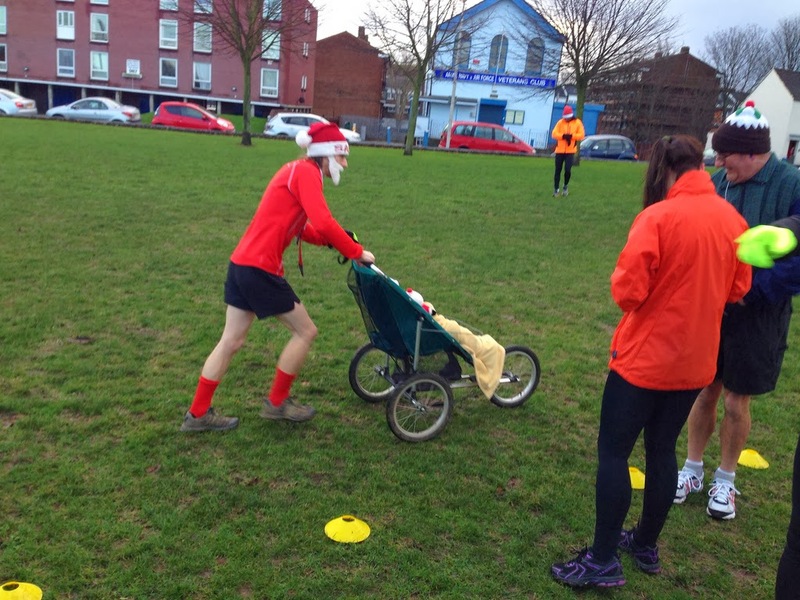 When our time came through it worked out that we set a new 5k buggy running pb of 24.45. I think we can probably go about another two minutes faster but we haven't done a time trial on a flat tarmac course yet and I'm quite enjoying gradually bringing our time down. 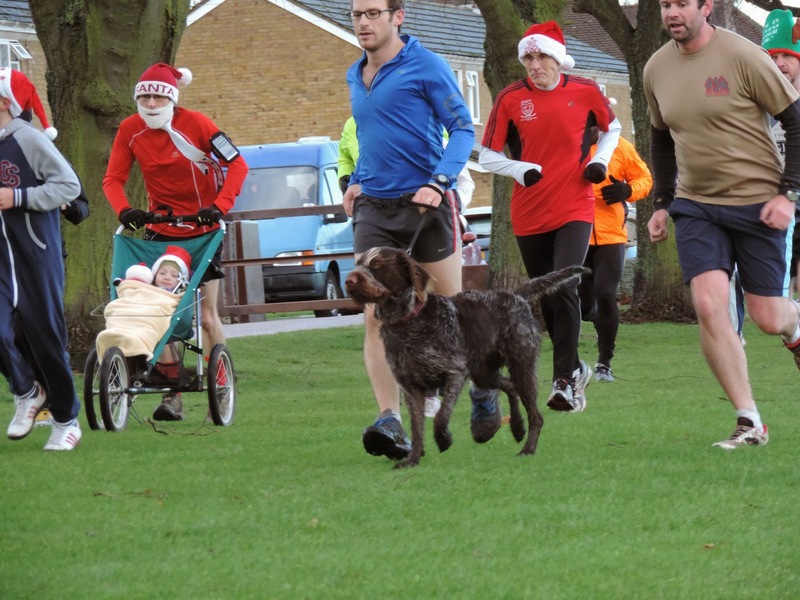 There was a bit of a '24' theme - Along with finishing in 24 minutes, it was my 124th parkrun and we finished in overall position 24 (also gender position 24). 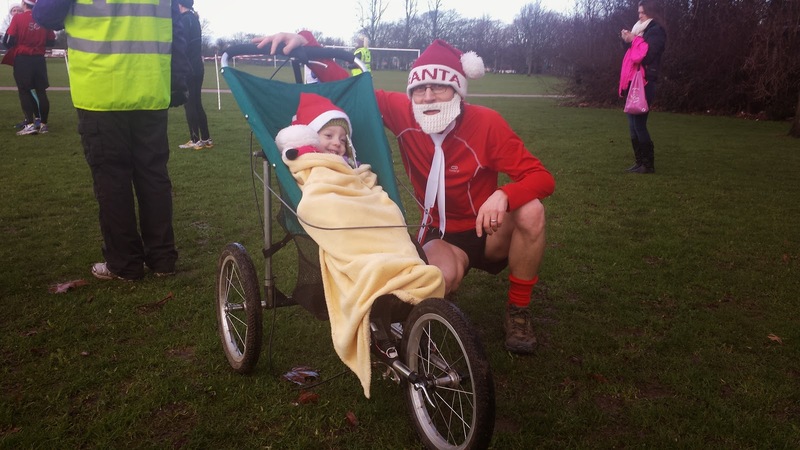 Post run, Matilda had a complimentary mince pie, which she dropped and meant Santa had to go back for a replacement. 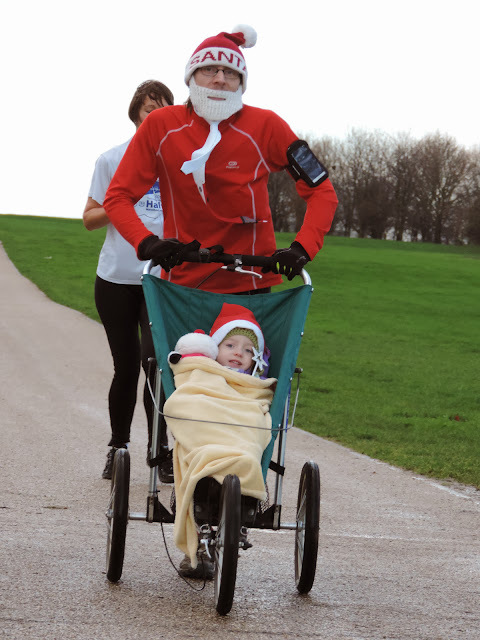 After chatting to a few fellow runners and to briefly to Tony the event director, we packed the buggy away and headed back along the A2 to see if Father Christmas had left any presents under the tree. We had a really nice christmas parkrun morning. Thanks so much to Tony and all the volunteers that came out to make the event possible and thanks to the photographers that were kind enough to allow me to use their photos.